This Pumpkin Patch Candy Bark with Pumpkin Spice flavors is as cute as it is delicious. Perfect for any fall gathering, Halloween party or as a fun recipe for the kids to make! Simple ingredients make this an easy recipe for the kids to create. Set up bowls of candies and jimmies and let them take over…be careful, the white chocolate is hot! This would be so cute as a party favor using these Free Printable Halloween Treat Boxes! Oh, how I love Halloween…my favorite holiday! I love hosting Halloween Parties, making my costume and sipping a fun spirited drink! 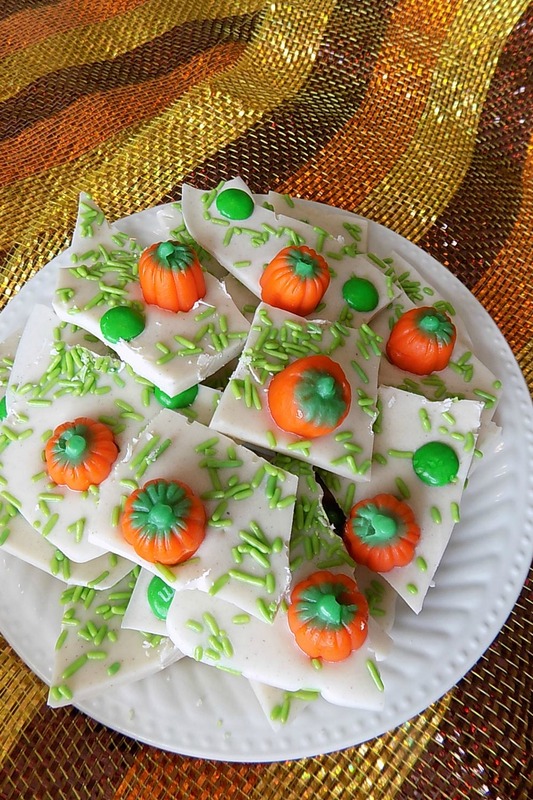 This Pumpkin Patch Candy is perfect for all parties – kids or adults! Place the White Melting Chocolate in a microwave safe bowl. Heat for 30 seconds and then stir. Continue heating at 15-second intervals until chocolate is completely melted. No not overcook chocolate or it will scorch. Place Mellowcreme Pumpkins on the White Chocolate. Sprinkle the Green Sprinkles and Green Candy Coated Chocolates over the White Chocolate. How fun to serve while watching the It’s the Great Pumpkin, Charlie Brown! 1. Place the White Melting Chocolate in a microwave safe bowl. Heat for 30 seconds and then stir. Continue heating at 15-second intervals until chocolate is completely melted. No not overcook chocolate or it will scorch. 2. Stir in Pumpkin Pie Spice. 3. Line a 9x13 baking sheet with parchment paper. 4. Pour White Chocolate mixture onto the parchment paper and gently shake to spread the chocolate evenly throughout the pan. 5. Place Mellowcreme Pumpkins on the White Chocolate. 6. Sprinkle the Green Sprinkles and Green Candy Coated Chocolates over the White Chocolate. 7. Place in the refrigerator for 1 hour or until candy is hard. 8. Once the candy is hard, break it into pieces and enjoy. Serve alongside this SPIDER WEB CHOCOLATE MILK! You might also like these YOGURT CANDY CORN POPS! SEE MORE AWESOME HALLOWEEN IDEAS HERE! What a cute idea!! Thanks for sharing on the What’s for Dinner Link up! You’ve been really creative with all your Halloween recipes! I bet Halloween is a blast at your house! Your pumpkin patch candy bark is too cute! Love it, it will be perfect for Fall parties. Thanks for linking up at the #HomeMattersParty this week. Don’t you mean 30 seconds not 30 minutes?